Russian Foreign Minister Sergei Lavrov talks to Rossiyskaya Gazeta about Russia's international challenges such as the upcoming conference on the Syrian standoff, security in the Arctic region and the plight of U.S.-Russia relations. In an interview with Vladislav Vorobyov of Rossiyskaya Gazeta, Russian Foreign Minister Sergei Lavrov spoke about preparations for the upcoming conference on Syria, the problem of security in the Arctic and the Russian response to the letter from U.S. President Barack Obama. Rossiyskaya Gazeta: Is it possible that the proposed conference on Syria could become a trap for Russia? If it fails, the Americans will say: “Well, Russia wanted peace talks and we have held them. But nothing came out of it. Let us now do it our way.” And they will proceed to implement their military solution. 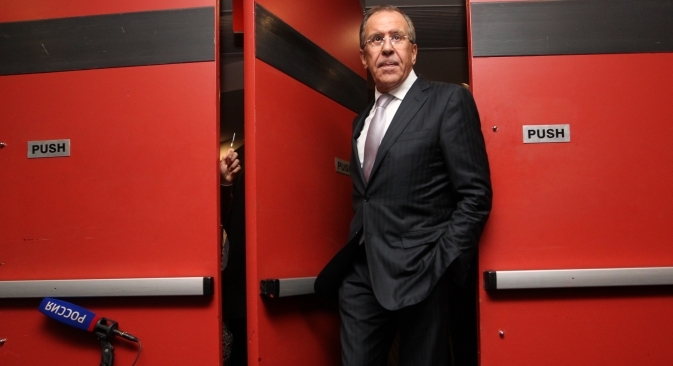 Sergei Lavrov: It can be a “trap” only if the parties act in haste. To begin with, the key parties must come to an agreement. The Syrian Government has said it is ready, and on the whole it has reacted in a constructive way, although it has suspicions as to whether the opposition will want to agree without preconditions, as stipulated in the Geneva Communique. All groups of the Syrian opposition must be represented at the Conference, including those acting outside Syria. R.G. : But there are other stakeholders – Iran for example – without whose participation the conference on Syria is unlikely to succeed. S.L. : Everybody seems to agree that those who attended the meeting in Geneva on June 30, 2012 will automatically take part. However, Iran and Saudi Arabia were not in Geneva a year ago. The Iranians were blocked by our American partners and the Saudis were not invited as a kind of compensation for the absence of Iran. We felt at the time that it was a kind of childish swap and not a very serious approach. Let us make up our minds: Either we want an absolutely representative composition of participants from the point of view of the task to influence all the parties in Syria, or we will sacrifice the success of the conference to personal ambitions and grudges. R.G. : Do you really believe that the stalemate over the Syrian problem can be resolved within the few days that the new conference will be held? S.L. : Some of our partners – and John Kerry also mentioned it – believe that several days or a week would be enough. I think that is counterproductive. The conferences that in the past had brought peace in the regions lasted months and even years. I do not want to see the same thing happen in Syria. It is counterproductive to set any artificial deadlines. R.G. : When will it become clear what terms the Syrian opposition will accept? S.L. : This week there will be two conferences: one in Istanbul, where the opposition will meet under the umbrella of the National Coalition of Syrian Revolutionary and Opposition Forces and the second conference will take place at about the same time in Madrid. Also this week, in between the two conferences, there is to be another meeting of the nucleus of the Friends of Syria group, which will consider what attitude to take on the Russian-American initiative. We should wait for the signal from the opposition, which has always opposed negotiations without preconditions. If the signal is positive, then we can think about the composition of participants in the conference, its regime and the rules for the external players. Only then can the date be announced. R.G. : Experts say that the Russian-American differences over Syria boil down to the key question: What should happen first, the resignation of Syria’s president Bashar Assad or peace negotiations? Have you come to an agreement on that with John Kerry during the last four meetings? S.L. : The United States has signed on to the Russian-American initiative of May 7, which has no preconditions. R.G. : U.S. President Barack Obama will shortly receive an answer to his message from Russian President Vladimir Putin. What next? S.L. : We must proceed step by step. Barack Obama sent a message to Vladimir Putin. The Russian president has considered it and will set forth his views on the key problems in our relations, including ballistic missile defense, strategic stability and all the factors that influence it. We will then wait for the reaction to our reply. R.G. : You attended a session of the Arctic Council in Kiruna, Sweden. The Western countries repeatedly criticized Russia for attempting to unleash an arms race in the Arctic. What is your answer to these charges? S.L. : The countries that have northern borders must ensure their security, including in the northern region, like in any other part of their territory. This is an axiom: Wherever you are and whoever surrounds you, you have to think about your security, including military security. It would be naïve to imagine that because we are talking about the Arctic this principle does not apply. Our strategy of Arctic development as one of the key areas envisages the broadest and most intensive international cooperation.